After winning the coveted Main Prize and Audience Prize of the 2017 German Music Competition at the Leipzig Gewandhaus, Juri Vallentin secured a leading place among the young oboists of his generation. 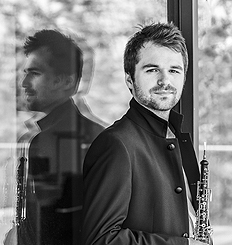 He had previously been a prizewinner at other major international competitions, including the 2015 International Oboe Competition of Japan (Sony) and 2016 International Muri Competition (Switzerland). He performs as a soloist with orchestras in Germany and abroad and also appears as a chamber musician at leading festivals such as the Ludwigsburger Schlossfestspiele and Davos Festival. Several radio productions bear witness to the scope of his artistic activity. Staatsorchester Hannover and makes guest appearances with such major orchestras as the Leipzig Gewandhausorchester and Bayerisches Staatsorchester München.